Explanation: In this alluring time exposure, star trails arc across the night sky above Monterey Bay and the lights of Santa Cruz, California, USA. 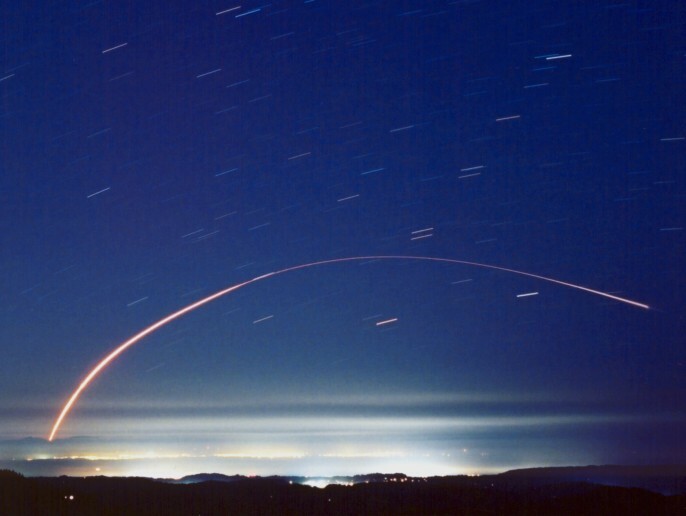 But since the exposure began around 3:01am PDT on July 15 it also records the long trail of a Delta II rocket lofting NASA's Aura spacecraft into Earth orbit. Watching from a vantage point about 200 miles north of the Vandenberg Air Force Base launch site, photographer Rick Baldridge reports that the trail represents the first five minutes of the rocket's powered flight with the ignition of additional solid fuel strap-on motors visible after liftoff, near the beginning of the track. The rocket trail ends at first stage shutdown. Seen under the rocket's path, the two brightest star trails mark the alpha and beta stars of the high-flying constellation Grus. The Aura spacecraft's goal is a comprehensive study of planet Earth's nurturing atmosphere.